I went along to some press days today with Victoria and grabbed her for a few moments to take some outdoorsy outfit photos. I really like how they came out, I sometimes wish I just had someone to take them for me as I just love the vibe so much more! I didn't really dress up today as I got up and ready in about 15 minutes. Threw on a metallic jumper, a hat and my trusty ASOIAF inspired coat and ran (got the tube) into Central London! Im absolutely obsessed with this American Apparel dress I bought at the weekend. It was super pricey at a ridiculously eye watering £39 but I have shamelessly worn it many many times since then. I could never get away with wearing it as a dress but it makes the perfect skater skirt for layering up. I made a video and have done a full post on the River Island press day which you can see above (or on my Youtube Channel)and then the post over on ETCLLYMLRS. This is such a lovely outfit love your hat I want one so bad! the fur collar on your coat is great! I love how you layered your jumper and dress. 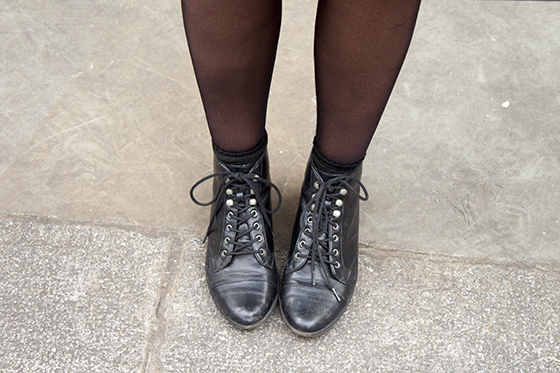 Love the ankle boots and bowler hat you always wear! Loved the video lovely, the pieces at River Island look fab. 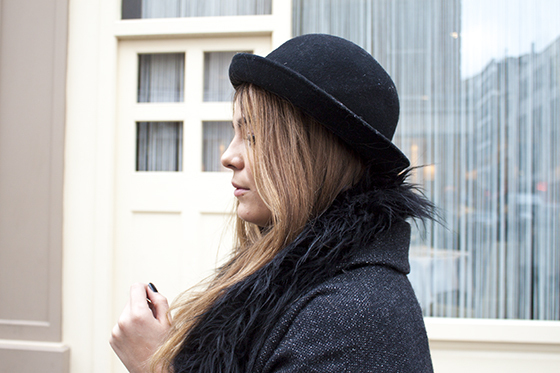 Also loving that boyfriend coat with fur collar and the bowler hat! I ADORE this outfit! So simple yet lovely, that coat is perfect! Never usually shop in river island as Im used to their ripped jeans and neon colours but this actually looks pretty good! I love this outfit, the coat is gorgeous! so pretty, I want it all! Love your way to wear total black and grey outfits. It's nice for you to post some outdoor outfit pics, but our indoor ones are absolutely amazing. can't wait for all the festival style pieces to come out! I wish I had someone to take photographs of me, too! You can never go wrong with lots of black. and the outfit is just stunning! Please check out my online magazine! I love the video, its a nice touch. Love this whole look! You can pull of literally anything!! Amazing look, love everything about it! Amazing jacket! That coat rocks the house, me want-y. Admittedly a weird point to fixate on buuut: what denier tights are those? me want-y too. I need a change from 100 denier. I love your hat Lily! Love the coat, looks so warm!